London, UK - Hugh Hopper and Soft Machine fans worldwide are rejoicing to the news of the pending release of HUGH HOPPER - DEDICATED TO HUGH, a 10-CD Archival Celebration of the music of bass guitarist, composer, Hugh Hopper comprised of previously unreleased Hi-Fidelity recordings. Compiled by Michael King, a Canadian Hugh Hopper Scholar, the CDs will be released individually, beginning with Volume One, entitled 'Memories'. This ten part series is to compliment a heretofore large body of work (over sixty titles) by presenting previously unreleased concert and studio recordings, with a focus on Hugh’s compositions as performed by groups under his leadership. All proceeds are to benefit Hugh's Hopper's family. Rare concert recordings, 1992 through 1995, of Hugh's project with Phil Miller, Didier Malherbe (Gong), Pip Pyle & Elton Dean - a.k.a. Short Wave. Hugh Hopper began his musical career in 1963 as bass guitarist in the Daevid Allen Trio alongside drummer Robert Wyatt. In 1964 Hugh founded The Wilde Flowers with his elder brother, Brian Hopper. Passing through their ranks were fellow Canterbury legends Kevin Ayers, Richard Sinclair, Robert Wyatt, and also Pye Hastings & Richard Coughlin who went on to form Caravan. After dissolving the Wilde Flowers Hugh became the roadie for his friends, The Soft Machine, then a Avant-garden pop group and house band of London's UFO Club, alongside The Pink Floyd. In 1969 Hugh replaced Soft Machine's original bassist Kevin Ayers, who left following two exhaustive American tours. Hugh's trademark bass sound (often delivered through fuzz boxes) and his compositions raised the music of Soft Machine to heights unmatched by their contemporaries. With the addition of saxophonist Elton Dean the 'classic quartet' developed a massively successful following in England and continental Europe, headlining numerous Festival's and producing the timeless and ground-breaking double album Soft Machine 'Third'. After leaving the Soft Machine in 1973 Hugh worked with many pillars of the jazz-rock fusion scene such as Gary Boyle's Isotope, Alan Bowen's Gilgamesh, Stomu Yamashita's East Wind and Carla Bley's celebrated big band. He also co-founded quartets with fellow Soft Machine member, saxophonist Elton Dean, namely Soft Head & Soft Heap. In the 1980's, 90's and into the 21st century Hugh composed a wealth of extraordinary music for his own groups and participated in countless improvisational settings and guest appearances. The music Hugh Hopper is a wonder to behold, a player of high distinction with trademark sound by turns gritty and gorgeous. Gonzomultimedia is honored to present this superb series celebrating the musical legacy of Hugh Hopper, for fans, friends and first time discovers. Vol. 1 – Memories – Now Available! This is the first of a ten part series compiled by Michael King. 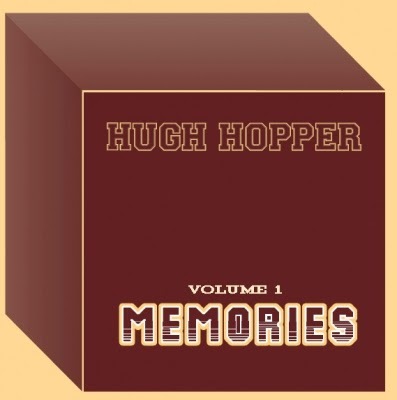 He writes: “My first encounter with the music of Hugh Colin Hopper backdates to the summer of 1976. While visiting a friend I was intentional played a record titled Volume Two from a British rock group about whom I knew little, The Soft Machine. The experience was staggering and prompted a radical reappraisal for the conventions I had been conditioned to accept as ‘progressive’. Once smitten I undertook to follow and purchase a spate of seriously inventive record albums that Hugh Hopper released and appeared on, namely; Hoppertunity Box, Rogue Element, Soft Heap, Cruel But Fair and Two Rainbows Daily. Throughout these works I found Hugh’s textural bass guitar by turns anchored and animated the music with ample good taste. Here was a rarefied musician who avoided overplaying his instrument in favour of approaches reflecting his personal musical Zen”. Technically, by processing his bass guitar with fuzz box, flanger, wha-wha, octave pedal effects, his use of tapes loops, and later on computer programming, Hugh constructed multilayer soundscapes with great attention to detail. His creative template embraced aesthetics well beyond the orthodox roles assigned to the bass guitar and its practitioner. As example, Hugh cleverly adapted the time altering effects of the repetitive tapes loops he was creating with two tape recorders in the early sixties - to his bass guitar - by playing such repeating patterns in real time. Furthermore, minimalist mutations and modularity often characterize the rhythmic, harmonic, melodic foundations of Hugh’s musical compositions (many displaying melody lines of uncommon length). These aspects, alongside a brilliant capacity to freely improvise, (dynamically from a whisper to a roar) distinguish Hugh Hopper as a consummate musician of great standing, one who thrived in myriad musical settings”. This first volume has the strapline “Many Friends” and features a dazzling range of Hopper plus collaborators over a period of some thirty five years. Recorded circa 2002. Whitstable, U.K. Recorded circa 2002. California and Whitstable, U.K.